Ahead of today's opening session, the air temperature is 20.8 degrees C, while the track temperature is 28.4 degrees. It is somewhat overcast - es expected - with a 20% chance of rain during the session. There are three reserve drivers on duty, Nicholas Latifi at Force India, Antonio Giovinazzi at Sauber and Lando Norris at McLaren - they replace Sergio Perez, Marcus Ericsson and Fernando Alonso. With the drivers' title decided two weeks ago in Mexico, all that is left to play for is the team title, which, of course, also decides the all-important prize money share-out. One team hoping for a strong weekend is Toro Rosso, which not only has its upgrade package for both drivers but is reverting to the spec-3 Honda power unit. Talking of upgrades, Ferrari has brought back some of the updates first introduced in Singapore and which subsequently proved detrimental to performance. However, following some behind the scenes work, the Maranello outfit is going to give them another go. Among other things, Mercedes is running two different rear wings, with Hamilton and Bottas looking likely to be carrying out back-to-back tests. Ahead of the green light, Daniel Ricciardo is already waiting at the end of the pitlane. Indeed, he has been at the end of the pitlane for almost ten minutes as due to a turbocharger change - which means a 5-place grid penalty - he wanted to ensure he was first out in order to avoid the sort of silliness we saw in Russia. The lights go green and Ricciardo is followed by Vandoorne, Norris, Leclerc and Giovinazzi. As more and more drivers head out there is a good mix of softs and supersofts, though Ricciardo is on the mediums. Raikkonen posts the first time of the weekend, a very conservative 1:20.666. Stroll warns of something moving in his pedal box. To which there is no answer. Ten minutes in and all but the Silver Arrows have appeared. Despite a wobble, Norris posts the second time of the day, a far more serious 13.312. Warned of kerbs, early throttle pick-up and a tail-wind, Norris improves by exactly one second to 12.312. As Norris improves to 11.938, Ricciardo, going quickest in all three sectors, responds with a 10.139. While the Red Bull driver is now on supersofts, Norris is on softs. Like Norris, Ricciardo has a couple of wobbles on the dusty track surface. Gasly posts 12.750 to go third - of three - as Raikkonen heads out again. The Finn posts 10.426 to go second, with Vettel posting 11.685 shortly after. Gasly complains that his steering is "a bit bad" and pulling to the right. Raikkonen improves to 10.223 as Gasly leapfrogs Vettel with an 11.567. "Not too bad," replies Norris when asked about the state of his tyres after ten laps. "They're going away a bit, but not too bad." An 11.156 sees Sainz go fourth, ahead of Gasly, Magnussen, Hulkenberg and Norris. Told that Hamilton is ten seconds behind and on a timed lap, Vettel replies: "Yep, I can see him." The Briton subsequently posts 32.080 while teammate Bottas posts 10.889. Raikkonen raises the bar with a 10.086 as Hamilton complains of traffic. As Verstappen goes second (10.111), Vettel improves to 10.141. Approaching the half-hour, all but Vandoorne and Giovinazzi have posted times. Bottas improves to 9.939 as Vettel improves to 9.973. Hulkenberg reveals that he is struggling with the feel of his brakes. Quickest in the first and final sectors, Hamilton raises the bar with a 9.423, as the Briton complains of a "lot of understeer". Surprised to hear a few expletives from Raikkonen, as the Finn is warned of the drivers behind him. As Giovinazzi posts 11.503 to go 16th, Vandoorne has yet to post a time. Despite pitting to have his brakes checked, Hulkenberg is still struggling, the German running wide on numerous corners. Grosjean complains that he has been blocked twice, but it is unclear who did the blocking. At the forty-minute mark, when the extra set of tyres are handed back, it's: Hamilton, Verstappen, Bottas, Ricciardo. Vettel, Raikkonen, Magnussen, Grosjean, Leclerc and Ocon. Ricciardo apologises after a somewhat messy stop at his grid slot. "Apologies... did I collect him," he asks, concerned that he hit a crew man. Told that he didn't, he giggles. Norris takes advantage of the lack of action and heads out to enjoy an empty track. He improves to twelfth with an 11.013. Magnussen and Grosjean head out to join Norris, followed by Leclerc and Latifi. In the Mercedes garage, the crew is busy inspecting the nether regions of Bottas' car which is understood to have developed an oil leak. PBs in all three sectors see Leclerc improve to ninth with a 10.346. Vandoorne finally posts a time, an 11.452 to go 18th, thereby demoting Latifi to last. Stroll posts a 10.799 to go 13th as Magnussen explores the further reaches of the run-off at T13. Only quickest in S2, where previously Hamilton had ruled, Verstappen goes quickest with a 9.011, just moments after the Briton has improved with a 9.107. Separated by just 0.096s, the pair are 0.715s clear of third-placed Bottas. Hamilton is advised that Turns 8, 9 and 10 are where Verstappen is gaining. Keen to join the party, Vettel splits Verstappen and Hamilton with a 9.060 as Ricciardo improves to 9.395 and Raikkonen to 9.573. "He's ******* stupid," says a clearly unimpressed Gasly of Latifi. This coming just moments after Frenchman criticised his own teammate for holding him up. Sainz also struggling, the Spaniard, like his teammate, going cross-country at T13. His oil leak clearly cured, Bottas heads out with 18 minutes remaining. The Finn immediately requesting a flap adjust as he encounters understeer. Currently, after a dreadful weekend in Mexico (and Austin), the Haas duo appear to be 'best of the rest'. With nine minutes remaining, Hamilton heads out again, followed by Raikkonen. The Finn is on softs. A moment for Norris as he makes a mistake at T1 and has to take to the run-off. "I got it wrong," he admits, "but what was the cause of the oversteer?" As he heads out again, Verstappen is told that "most people have been quickest on their first timed lap". "The space we wanted, Vettel's got," Verstappen is told. "Stroll just got in my way," complains Norris, clearly getting into the spirit of things ahead of his race debut next season. 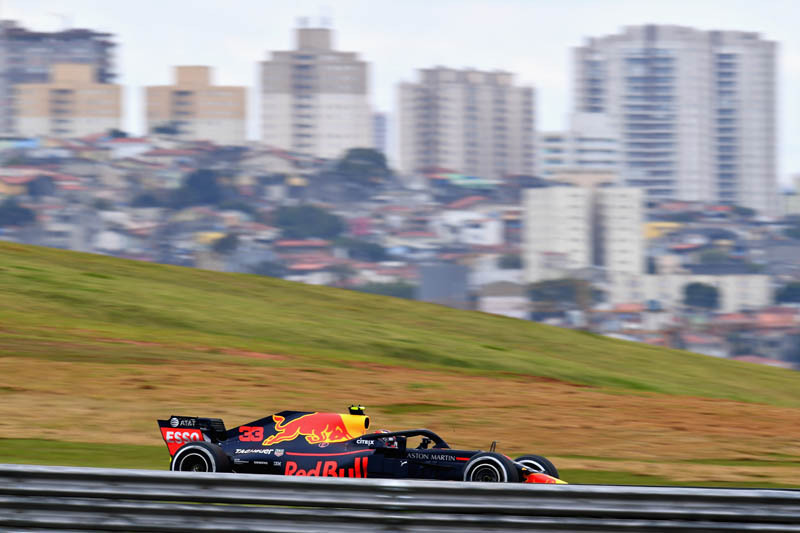 Verstappen is quickest, ahead of Vettel, Hamilton, Ricciardo, Raikkonen, Bottas, Grosjean, Magnussen, Leclerc and Ocon. Sainz is eleventh, ahead of Hulkenberg, Giovinazzi, Stroll, Gasly, Norris, Sirotkin, Hartley, Vandoorne and Latifi. 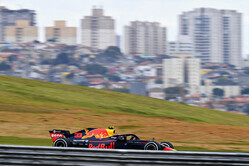 Check out our Friday gallery from Interlagos, here.